In early March, the winter-brown grass on the vacant lot at the northwest corner of 30th Street and Highland in Kansas City reflected the harsh winter weather that pummeled the city for several months. It looked beaten, exhausted, almost breathless. But this land is where the Rime (pronounced REE-may) Buddhist Center has placed its long-term hopes. 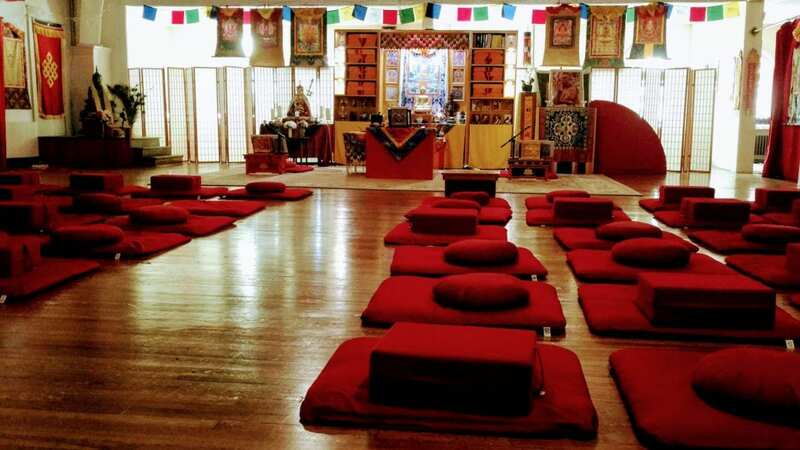 This is where, one day — maybe in 10, 15 or even 20 years — Lama Matthew Rice and Rime members imagine having their very own space. It’s just that the road from here to there has financial potholes and potential detours. And yet Rice and his group, committed to practicing Tibetan Buddhism, are using Buddhist ideas to help them travel this bumpy journey. Which means they are recognizing life’s transience and remembering that the idea of attachment is far from a core Buddhist value. They are approaching all this, in other words, with a sense of calm, of equanimity, of peace. The center’s current building, at 700 W. Pennway St. on the western edge of downtown Kansas City, Missouri, costs the center thousands of dollars each month in rent and upkeep — and that total is more than has been coming in from members, gift shop sales, and fees for classes the center offers. In fact, the center has been running a deficit for years, even though Rice receives no salary as its spiritual director. Rice supports himself by working for a company called Mosaic, a Lutheran non-profit that works with adults with intellectual disabilities. His job is to train people how to use computers. A recent effort to get members to pledge more in monthly donations has brought the center closer to financial stability, but probably not close enough, Rice acknowledges. So he and other center leaders are weighing options, which include buying a vacant church in Kansas City, Kansas, or finding less-expensive rental property somewhere. And it’s a decision that needs to be made soon, before lease-renewal time comes in late summer. No matter what choice is made, it means putting off the dream of building a new center on the recently acquired land at 30th and Highland. But the terms under which the Rime Center acquired that land last year from the Land Bank of Kansas City means it cannot sit idle more than a year. So Rice and the Rime Center plan to construct a meditation garden there this spring. The idea is that it can be used by anyone and will be one way to beautify the neighborhood while the dream of building a new center there is deferred. “Our attendance is in a lull right now,” Rice says. He thinks it has less to do with the Rime Center itself than with the fairly widespread societal trend of people not engaging as much in spiritual communities. Such numbers disappoint Rice a little and, as he told me recently while giving me a tour of the current center, it makes him a little sad that a move may be necessary. But his Buddhist spiritual training, he says, teaches him how to handle such troubles without getting unnecessarily worried. Buddhism is a non-theistic tradition, meaning that it doesn’t propose a belief in God. Rather, it’s a spiritual practice based on the “Four Noble Truths” taught by Gautama Buddha, who lived about 2,600 years ago. Those truths teach people how to recognize and relieve suffering. All of which means that Rice believes there will continue to be a Rime Buddhist Center, but how or where is uncertain. And that doesn’t stress him out. At least not in a debilitating way.